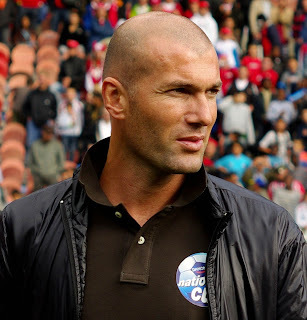 Zinedine Yazid Zidane(born 23 June 1972) is a retired French World Cup-winning footballer. Zidane played for club teams in France, Italy and Spain, and was the captain of the French national team. He is widely considered as one of the greatest players in the history of football. 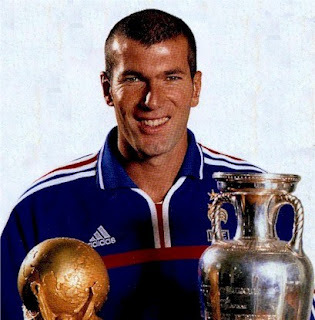 He was the iconic figure of a generation of French players that won the 1998 World Cup and 2000 European Championship. 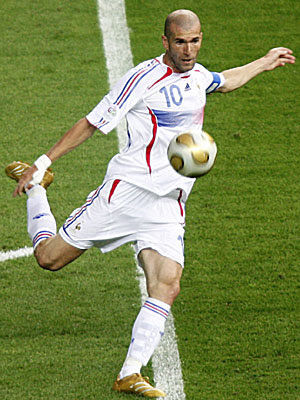 After a brief international retirement, he returned to the national team in 2005 and captained France to the 2006 World Cup Final where he won the Golden Ball as the tournament's most outstanding player. At club level Zidane won the La Liga and the UEFA Champions League with Real Madrid, two Serie A league championships with Juventus, and an Intercontinental Cup, and a UEFA Super Cup each with both aforementioned sides. He is alongside Brazilian striker Ronaldo, the only three-time FIFA World Player of the Year winner; he also won the Ballon d'Or in 1998. He retired from professional football after the 2006 World Cup. Both France and Algeria consider Zidane a citizen, but he was ineligible to play for the Algerian national team. There was a rumor that coach Abdelhamid Kermali denied Zidane a position for the Algerian squad because he felt the young midfielder was not fast enough. However, Zidane dismissed the rumor in a 2005 interview, saying that he would have been ineligible to play for Algeria because he had already played for France.